50% increase in unemployment for young ethnic minorities – have the coalition abandoned 16-24 year old black and Asian youth? Black people are 17 times more likely than white people to be diagnosed with a mental illness. Furthermore, 56 percent of Black inpatients in mental health units have been sectioned, more than any other ethnic group, and they much less likely to receive talking treatment but higher doses of medication. According to psychologist Malcolm Phillips this is because black people are more likely to be seen as a threat and thus given a more serious diagnosis, and thus more likely to be sectioned and forcibly medicated. Private ownership of the means of production – rather than collective or state ownership. Goods are produced for sale in the free market – rather than for personal use of for barter. The reason producers produce goods is because they wish to make a profit – the profit motive is central. To the above I would add a fourth component- which is wage labour – The majority of people in a Capitalist system make their money through wage labour – by selling their labour power to their employers. It is the best system for ensuring that what is produced matches up to the needs and wants of the people – because producers only make a profit if they supply what people demand. Thirdly it is argued that production should be efficient because Capitalists are in competition with each other – and the more efficient one’s business is, the lower the cost of production, the lower the price and higher profit. Defenders of Capitalism argue that the genius of Capitalism is that it transforms individual self interest into collective good – selfish capitalists want to make a profit, but they have to produce what people want in order to make a profit! Firstly, because the Capitalist class exploits labour –the interests of the Capitalist class are in conflict with the interests of the working class. Secondly, each individual member of the Capitalist class is in conflict with other members of that class – Capitalists compete with each other to attain an ever greater amount of profit and an ever greater share of wealth. Each individual cpitalist, faced with competition from other Capitalists, seeks to maximise profits relative to his competitors. One way in which this can be done is through technological innovation, thus lowering the costs of production below the average costs of production in the sector, which will increase the rate of profit. This will attract further investment (capital). The problem with this is that it is only a short term solution because eventually other Capitalists will innovate in the same way and the competitive advantage will be nullified, and we return to a level playing field. Of course some capitalists are unable to afford these technological innovations and go bankrupt, causing unemployment which reduces the bargaining power of those in work, which allows the remaining Capitalists to reduce the wages of their workers, thus increasing the rate of exploitation. At the same time, surviving capitalists buy up the means of production of those firms that have bankrupted at below market value thus leading to a concentration of ownership and a concentration of power in the hands of fewer and fewer people. 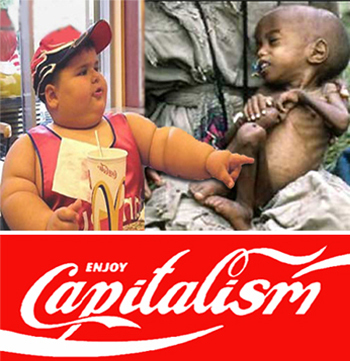 From the Marxist point of view therefore, the logic of Capitalism that wealth gradually becomes concentrated in the hands of fewer and fewer people, and the masses get ever more exploited and impoverished. http:/manybooks.net/titles/marxengelsetext93manif12.html – download free ebook – I have a copy permanently on my ipod! – Ironic I’m sure.